For the Army, Navy, Air Force and Marines, new technologies are always being developed to help defend a homeland. From the Australian Defence Force (ADF) to any other allied nation's forces, new aircraft, ground combat vehicles, sea craft and personnel-carrying vehicles are always acquired in order to keep up with an ever-evolving defence strategy. And with new machinery comes the need for an entire suite of new support equipment. Gaining safe access around machinery requires customised solutions – mobile scaffold, ladders, work platforms, gangways, bridges and more – and is essential for keeping machinery on standby and ready for anything. SafeSmart's reputation for possessing a full understanding of defence force needs, protocols and procedures means that any defence force acquisition often results in the commissioning of the design and manufacture of new custom support infrastructure by them. With the development of defence force infrastructure ongoing and unending, SafeSmart’s commitment to developing new configurations of maintenance platforms, mobile scaffold, access stairs and much more is strengthened year to year. With close ties to the ADF, SafeSmart Access have provided consultation for, designed and custom-made high quality portable access equipment for aircraft, boats, land vehicles and more. And SafeSmart's reputation is known across the seas as well, with commissions tendered by defence forces in South East Asia, New Zealand and the US. 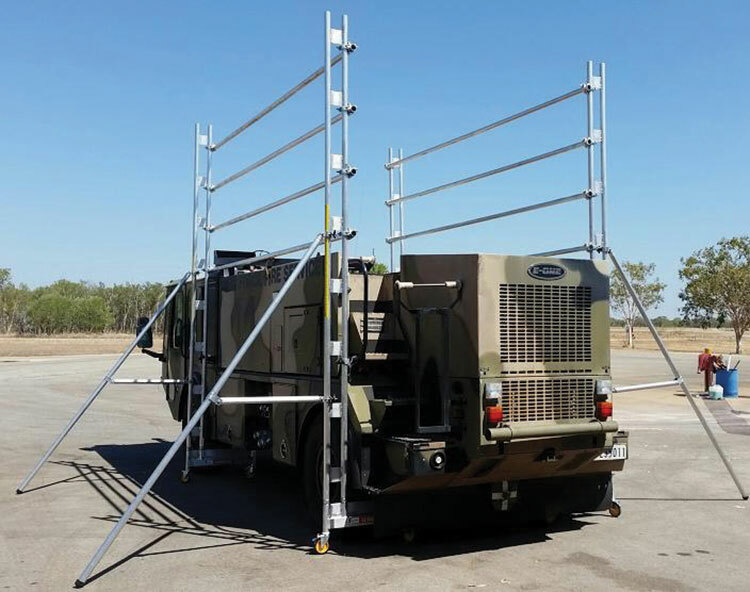 Any defence force machinery of any shape and size can be measured and fitted with access ladders and platforms – from tanks to troop carriers, aircraft to sea craft. If you are in acquisitions and need maintenance access equipment from a company that has been proven in defence time and time again, ask SafeSmart Access today for the highest quality servicing platforms, mobile scaffold, cantilever stairs, reach deck platforms and more.